The International Game Developers Association has responded to the "Rockstar Wives" controversy, saying that excessive, undisclosed overtime is "deceptive, exploitative and ultimately harmful" to developers, their products and the industry as a whole. A group calling itself the "Determined Devoted Wives of Rockstar San Diego Employees" published an open letter on Gamasutra earlier this week, alleging that the studio has been in an unending "crunch mode" since March 2009 that's beginning to take a physical toll on the overworked, undervalued employees. Management, according to the writers, cares little for their plight, opting instead to enrich itself while maintaining the unfair status quo. The IGDA, which maintains a "Quality of Life" special interest group to help address related issues in the industry, has now weighed in on the matter with an open letter of its own. 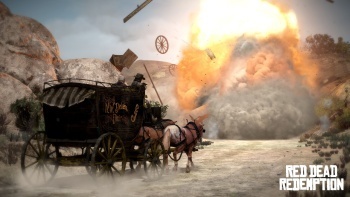 It says little about the Rockstar San Diego matter directly, but notes that its December 2009 survey of more than 3300 developers revealed that while more than half felt they needed "more time for themselves and their families," a majority also said that their studios rarely crunch and do what they can to avoid it. "Events like these raise the awareness of quality of life issues in the industry and among the public," the IGDA said in its response. "The IGDA has made clear its stance on excessive uncompensated overtime, and this instance represents an opportunity for reflection across the industry. Particularly with the stresses imposed by the declining economy, game studios, like other independent businesses, are under increased pressure and therefore are more susceptible to production concerns." "The Board of the IGDA and the IGDA's Quality of Life Special Interest Group extend their support to the developers at Rockstar San Diego and their families, and wish them the best in resolving their concerns," it continued. "The IGDA's Quality of Life Special Interest Group has issued an open invitation to Rockstar developers, studio heads, and corporate officers offering consultation to bridge overtime gaps on the basis of their common interest in producing the best game product possible." It's not exactly a hard-hitting condemnation of the conditions at the studio but as IGDA board member Erin Hoffman noted, there are limits to what the association can do. "No one from Rockstar has ever contacted [the IGDA] nor, to my knowledge, sought advice from the IGDA on this issue at all," she wrote on Gamasutra. "I have individually spoken with multiple Rockstar San Diego developers over the years and have known that this was brewing, but until someone was willing to do something about it, there was nothing to be done from the outside." Rockstar San Diego is currently at work on Red Dead Redemption, which is scheduled for release in April. Separate from the Wives controversy, however, some sources are saying the game has "huge problems" and even if it does ship, may never be profitable.